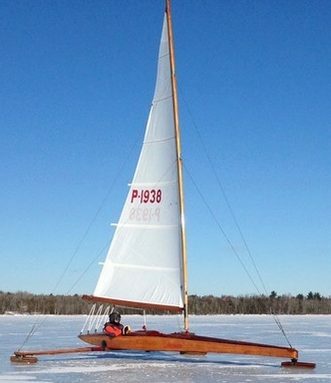 Photo of a Palmer iceboat, LINGWES, from Chickawaukie Ice Boat Club website. PS. This boat is still for sale. Contact Bill Bucholz. I was going through some images on a snow day here and came upon a few things from out your way. These come from a scrapbook that Greg Strand recently acquired on behalf of the North Shrewsbury Iceboat & Yacht Club of New Jersey; Greg is archivist/historian of the Red Bank crew.The scrap book belonged to George Seger – an active NJ ice boater in the 30s and 40s – he’s in Wings on the Ice (p. 59). Greg called me and I took digital images of as much as I could. Great stuff. As you see in their elegant letter head, the Palmer Boat Company of Fontana, Wisconsin was an early builder of scows and iceboats. Many vintage Palmers have come across the Buy and Sell page of this website over the years. A quick internet search about Palmer boats turned up some interesting facts. Buddy Melges’ father, Harry Sr., worked for Palmer before starting Melges Boatworks. 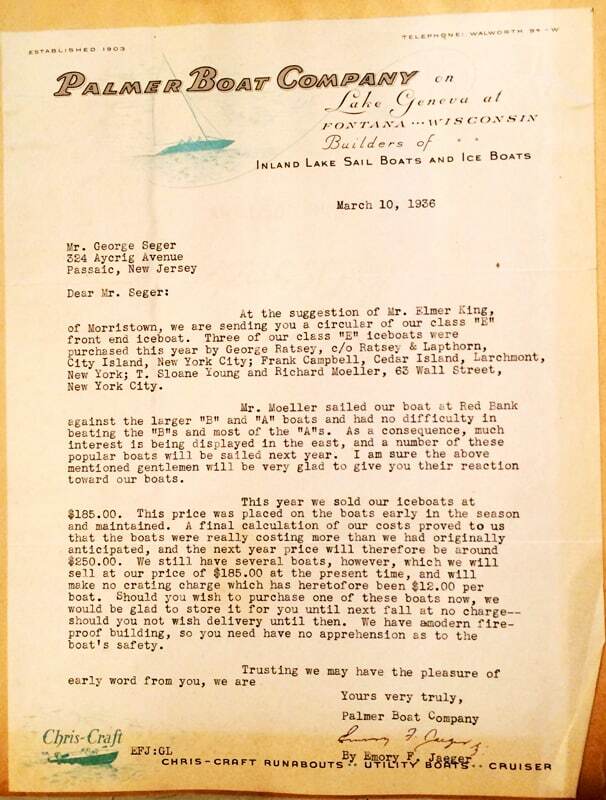 Maine iceboater Bill Bucholz wrote a story about a Palmer, LINGWES, for the Chickawaukee Iceboat Club that referenced the same Richard Moeller as in this letter to Mr. Seger. Thank you, Brian, for sending this out our way. Previous: Palmer on the Prairie,, December 2, 2016 on iceboat.org. If you interested in the early history of ice sailing in the United States and efforts to maintain and sail historic Stern Steerers, Brian’s website, White Wings and Black Ice is a must read.